Beesthorpe Hall being made to look rundown and Victorian. 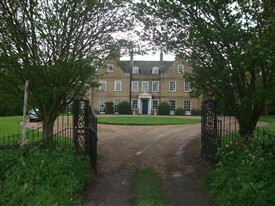 Caunton, the location of Beesthorpe Hall aka Thornley Manor. On the 11th November 1983 a TV show hit our screens and became one of the most original and talked about programmes of the 1980's, Auf Wiedersehen Pet. The first series which was set in Germany, was an instant success, and a second was being planned in 1984. The setting was to be in Nottinghamshire, and the location scouts were looking for an impressive country house to be used for the show. In 1984 the owners of Beesthorpe Hall got a knock on the door from two of the location team looking for a large country house. At first Beesthorpe was deemed too small and after a quick look round they left, telling the owner's son they would be in touch. A couple of weeks later, a phone call to the family; another visit and everything was set in motion. There were a few problems with Beesthorpe Hall however: it was lived in, too clean, and didn't look abandoned. 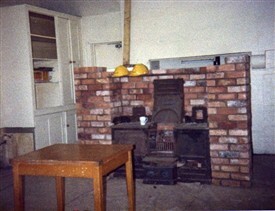 The people from Central Television employed a team of builders to change this lived-in family home into a run-down wreck of a house, complete with cobwebs and dust. 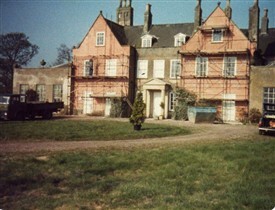 In late 1984 the building and production teams spent months painting inside woodwork a dirty brown colour, adding wallpaper which had to appear old and peeling, and generally making it look like a shabby country pile. 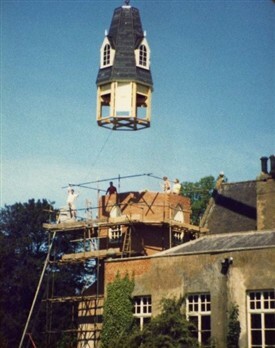 The production team from Central Television wanted the house to appear Victorian, and so a huge addition was installed, a false Gothic tower to the rear of the building. This was soon inserted and spent months on the property to give time for weathering, and make it fit in with the rest of the building. The front of the hall also had thousands of false red bricks stuck to it, and the main entrance was changed to the arched door which can be seen on screen. The gardens to front and rear had to be left for several months, with no pruning or grass cutting. Friends of the family used to comment on how bad the place was looking; but to keep news of this massive TV show being filmed in the area, only a few really knew why the building and grounds were in such a state. 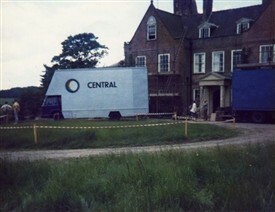 The dining room in Beesthorpe Hall was used as a store room for the film crew's equipment, and there was even talk of a security team staying there to make sure nothing was taken. As the family was still living there, and not many people knew about the filming of Auf Wiedersehen Pet, this was not needed. The internet is full of stories about what exactly happened, with rumours of Tim Healy being thrown through the windscreen. After talking with the owner's son, I found out it was nothing more than a small collision, with neither party suffering any major damage other than a couple of bruises. Since 1986, when the Hall was seen on screen in Auf Wiedersehen Pet, it has retained very much the same character and feel as it had all those years ago. I have visited Beesthorpe Hall several times myself, and to be stood outside, and also walk around inside, what is such an iconic building to millions of the show's fans is a rare treat; I always feel most fortunate that the owners were so obliging and very gracious in letting me into what is still their family home. This page was added by Lee Barratt on 25/05/2012.